Sorry, things have been slow the past few weeks, but I have been helping other departments with web graphics. As many of you know, editing cool AE artwork into desktop wallpapers is one of my duties (beside being Project Lead fro HS). These editing skills have been greatly needed by the AQWorlds and HeroMart teams, as the original graphic editors are hard at work getting the next AE Artbook finished. Once the Artbook is finished, I will be able to focus back on HS. Until then, I will be doing my best to drop new items into the game whenever possible and soon we'll have new HS homepage artwork. Benefits of helping other teams include getting to work with talented people, who work directly on AE games, and those that promote through HeroMart and AE webpages. Together, Nythera and I been able to update some artwork for the help pages. 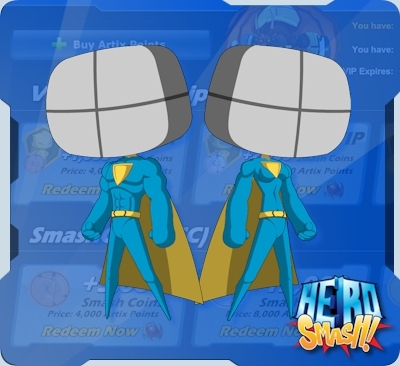 The best part is I was able to work with the webpage team to create artwork and setup a HeroSmash staff page! (http://www.artix.com/pages/hsstaff). This will help let players know the current 'active' team. Whenever possible, I been reviewing the history of char designs and pooling all the ideas into a new design (see image). I'm not one that believes heroes are only muscle bound, as true bravery is in the heart, not limbs. Striking a balance like this is important, but this in no way means we changing past designs or stopping to use of current ones. These new 'variants' only add more of a super power comic-ky feel to the game. Feedback is welcome, as we are all working to make this game!